I hate to say it, but it’s too warm. We still have tomatoes ripening in our sheltered garden. Tomatoes at the end of May? And the mozzies haven’t died off yet. Still mozzying around at the end of May? And we’ve hardly had to light a fire either. Walk down Queen Street and you’ll see some dressed for the winter that hasn’t arrived, and others, more sensibly, still in their summer outfits. The winter solstice, our shortest day, is coming up on the 21st of June, less than a month away. Where’s winter gone? I’m all too aware of limitations of anecdotal experience, but as global warming cranks up, we all become witnesses whether we like it or not. Anecdotal experience piles up. In this case, my subjective impressions are backed up by the data. This April tied with 2010 as, globally, the hottest April ever recorded – which is going back more than a hundred years. That’s a global average of course, conditions will vary locally, but here in the north of New Zealand winter temperatures have barely dropped below a daily high of 20 degrees Celsius. I think we’ve had a chilly 17. As I write there is rumour of a cold snap on the way. How crazy to be holding out for a cold blast! Waiheke, however, needs its cold winter snaps, a frost or two in the sheltered places, a few days sustained rain instead of these squally thunderstorms. Never mind, I tell myself. The coldest weather always comes after the shortest day. So here is the paradox, the difficulty: who in their right mind is going to object to such a mild winter, even if we are a bit too embarrassed to keep calling it an ‘Indian Summer’? The pastoral farmers are not complaining In the north and Waikato, rain combined with mild temperatures have kicked along grass growth. And here’s the curious and rather scary thing. As with pain, we forget. We forget what cold is. The body adjusts and forgets too. It’s up the mind to remind us of the reality of the situation – and our powers of observation. I know from my research that monthly average temperatures have not dipped below the twentieth century average since September 1985. More than time enough for the body to forget, for collective memory to fade. Then when we do get a cold blast we act as if our throats had been cut, not that this a norm we have forgotten. It’s not nice, with knock-on effects that are multiple and often unforeseeable. Disaster may be next year for us but it’s now in many parts of the world. It won’t be so nice when, for example, dengue bearing mozzies move in (apparently that can happen when it doesn’t get cold enough to kill them off over the winter). No amount of ‘bio-security’ can hold back the effects of rising temperatures on species distribution. In the same week the April figures came out we learned that catastrophic collapse of the West Antarctic ice sheet has begun. We kicked the process into motion and now we can’t stop it. Sea level rises beyond that predicted by the IPCC, who can’t predict the timing of such events and leave them out of their calculations, is now inevitable, unstoppable. I’m off down the garden now to pick what I expect to be the last of those tomatoes. Got some insect repellent. With news of the heralded El Nino Weather condition on the way, with likelihood of soaring temperatures, I’m starting to wonder if 2014 won’t be remembered as the year the winter failed. The ancient Chinese believed that music could melt ice. Now we know better, but we have always believed it can melt hearts. Divine music is said to speak directly to the soul, and we do need the soul on board here as the mind just can’t do it alone. Often the heart knows what the mind can’t accept. Music doesn’t just lift us and inspire us, it informs us. Discovering the amazing musical experiment ‘Song of our Warming Planet’ reminded me of the part music can play in both informing people and combating misinformation, so I decided that the first in this series would be dedicated to music, starting with the ‘Song of our Warming planet.’ I can do more than scratch the surface of this subject, which deserves a much fuller treatment. You can find the same video here, renamed Mother Nature Needs Us. In a previous post, I talked of the ‘love of graphs’ and how I liked the way graphs can encapsulate a lot of information. But not everybody responds to visual information in the same way. Do you see what I see? So how about an audio-graph? (just made up the word! ), that is, a graph set to music. That’s what David Crawford of the University of Minnesota did, transposing temperatures into musical notation. You can either watch the graph move as you listen, or close your eyes and hear the movement, that insistent upward movement. The listening experience can be profound, as the music form of the graph emphasizes its linear nature, whereas the eye can jump all around. Music has always been a great vehicle for satire, and good satire is healthy. They say that what a despot hates most of all is mockery; the bully can’t bear being laughed at. The despot hates the singing of the world. Not so amazing to think there was a time in our culture when woman were not allowed to laugh or sing because such joy was a threat. Why? Because it was not under control. The opening shots of ‘I’m a Climate Scientist’ by HUNGRY BEAST are of Republican politicians who tend to preface their rejection of climate science by admitting they are not climate scientists, as if this admission somehow qualifies them to rubbish the science (twisty stuff). Her sentiment applies to all of us, although seldom articulated so beautifully, or with such heartfelt feeling. If, as the physicists tell us, the universe is a harmonic, it’s time to start listening to the song. I began this climate change blog because of the fundamental realization that man made global warming is the greatest spiritual challenge we face, as individuals, as a culture, as a species. We are now in a situation where we can contemplate our own extinction as a species, write articles and learned papers about it, discuss it in blogs, do an intelligent analysis of the causes of it – everything in fact except stop it.To do that we need a planetary uprising of a massive scale against entrenched greed, and how likely is that? The suicide of Collapse theorist Michael C Ruppert, who took a Glock 30 .45 caliber pistol and shot himself in the head, came at the same time as our ANZAC weekend. Both a very American death, and one which resonates with all of us who engage with, and attempt to alert everybody to, the unfolding catastrophe. 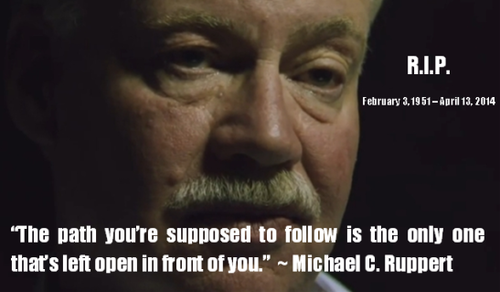 Michael Ruppert gazed unflinchingly into the face of that catastrophe for most of his life, and in the end had to look away. Despite our most intelligent awareness of it, despite all the ongoing warnings, the process of destruction continues unabated – what is there not to despair about? Those who saw the brilliant documentary, Collapse, would have seen an intense, chain-smoking Ruppert burning away the illusions of our culture as if with his very own life force. An electrifying performance. In the last years he became a full blown Survivalist, and joined forces with Tom Brown who teaches survivalist skills, but in the end he lost hope even in Survivalism. It takes every ounce of our courage and strength to live in this world with awareness. Forsaking awareness for the ignorance-is-bliss life was not an option to Ruppert, and in the end, living with the reality of it wasn’t either. We have to take care of our truth tellers, our sensitives, our prophets, our visionaries. There is war going on, and Ruppert was a warrior who fell in battle. We can do better than remember him. We canhonour him by living and working within the understanding of the world that eventually killed him. This is one place we cannot follow you Michael. Farewell and peace. Predictions based on sound science have a way of coming true. Radio talk-back hosts and other willful ignoramuses will often repeat the ‘joke’ that if climate scientists can’t predict the weather for next week, how can they predict it forty or fifty years in advance? The joke is designed to make climate scientists look stupid, as if because you don’t know where the next wave may fall you can’t tell if the tide is coming in or not. Climate science predictions are based on probabilities, and the imagery scientists use reflect that. Bill McKibben came up with the metaphor of weather on steroids. Just as a player is more likely to hit a six on steroids, but you can’t tell which ball it will be, the weather, pumped by Greenhouse gasses, is more likely to deliver extreme weather events. Jim Hansen of NASA uses the dice analogy. If you load the dice in favour of the six, you will get more sixes, but you will not be able tell in advance if any particular throw will be a six. All you can know is that the more you load the dice in its favour, the more likely the six will come up. The more we change the earth’s energy balance, the more we court extreme weather events: it’s not rocket science. Now a new probability has entered the mix. A super El Nino. To understand the importance this, we need to look yet again at the Annual temperature anomaly, which I explain here. It’s worth looking at yet again. That event is clearly shown on the chart as the first of the very tall red lines. If the temperature were to take another such quantum leap, the subsequent effects will be severe. Most the literature deals with the effects of this developing El Nino on the Norther Hemisphere. However, the Sydney Morning Herald has picked up the story and predicts worsening drought for Australia. Bad news for Aussie farmers who are desperately hoping that things will return to normal. Whether this will apply to NZ is yet to be seen. This final quote, however, is from NZ’s NIWA, and broadly sketches in the effects we might expect under normal, non-steroid conditions. You might have heard the story of the donkey who died of starvation because he couldn’t decide which bale of hay was the biggest. We all know what it’s like to put things off, to procrastinate. I mean, you guys. Me? I can’t make up my mind if I’m a procrastinator or not. I’m just an ordinary carrot and stick kind of person, not a big player in the procrastination stakes. But the politicians are. We pay them to procrastinate for us. Maybe we think they are the only ones who pay the price, and the price just keeps on getting bigger and bigger. Readers may be familiar, not too familiar I hope, with the inexorable logic of the IRD and money lenders of all kinds. A small debt can turn into a big one. Before you can say ‘compound interest’, which calculates the interest on all the previous unpaid interest plus the original amount, your home is gone as well as the shirt on your back. We can call that ballooning interest a positive feedback effect. The greater the debt the greater the interest owed, and so the greater the debt. A win-win-win-win for the money lenders and a lose-lose-lose-lose for good old broke you. The longer you put off paying the worse the problem gets. It is not surprising that Nicholas Stern, Britain’s top Banker, was the man to apply the term procrastination penalty to our response to global warming. The longer we put it off, the more we have to pay, and the more impossible it comes to pay. Positive feeback effects work here too, like compound interest. The more the arctic ice melts the more open water there is to absorb rather than reflect sunlight and so the more the ice melts. It’s not the banker or money lender who comes to take away your house but the flood, the drought, the mudslide, emissaries of climate change. We cultivate doubt in order to bolster procrastination. Not doing something in the face of a crisis, or a need to act, is actually quite difficult, requiring considerable mental agility. The newly released IPCC report on climate change drives the point home. This document, the product of 800 authors, over 1500 researchers involving scientific institutions world-wide represents the state of our knowledge. While remaining clear about the consequences of global warming, the document also puts some emphasis on ‘adaption and mitigation’. Since warming is here to stay, we’d better try to get used to it. This is realistic, but it is also full of pitfalls. We could waste a lot of time doing the wrong things for misguided reasons. Culturally we seemed trapped in our own positive feedback cycle. The more we procrastinate the worse the problem gets so the more we procrastinate. Maybe that’s why there is such a gap between the scientific consensus and the political perception, beautifully illustrated by this graphic from Climate Progress. Maybe that’s the real secret of procrastination. It’s our addiction that paralyses us. It’s hard to accept things we don’t want to accept. There is an old joke to the effect that you will have a hard time convincing somebody that something is true if that somebody’s salary depends on the assumption that it is not true!If your salary depended on you believing that the earth was flat, you’d pretty soon become a believer. Research has suggested that we find arguments we do not agree with more difficult to follow than those we are predisposed towards. A mental resistance sets in. Especially when belief systems are threatened. I have noticed that the most fervent believers in unrestrained free enterprise and ‘free trade’ are very reluctant to accept that their actions have moral and environmental consequences. That’s often because they are making money by not facing those consequences. Since starting this blog a couple of people has asked me if we really can be sure that humans are causing global warming. It’s all in the word really, really, but the answer is that we can be as sure that we are creating global warming as we are that cigarette smoke is causing cancer. It strikes me that as a culture we are developing a cavalier attitude to evidence, and the empirical method, which is the painstaking gathering of evidence and careful drawing of conclusions from that evidence. As a culture we had to fight hard for the establishment of the importance of evidence against the ravages of religion and superstition. Church elders refused to look into Galileo’s telescope and branded it an instrument of the devil. Some Republican Senators have said that they’d like to see climate scientists publicly flogged or put in stocks, using a kind of language that deliberately recalls the bad old Middle Ages before the age of science. From the late 13th to the 17th Century the ‘Enlightenment’ took place in Europe which allowed science to take root and for the empirical method to flourish. Empiricism is not the Grand Answer to Everything; it is just a part of the mosaic of our understanding of the multiverse (as the universe used to called), but it does keep us grounded. Keeps us in the real world. Peer reviewed science is not infallible, but it is the nearest we have to certainty in an uncertain, contingent world. The fact the 97% of climate scientists agree is itself remarkable. It’s a same kind of massive consensus that we see around the dangers of smoking. There’s a notion around that ‘evidence based’ thinking can somehow be weighed in the balance against ‘faith based’ thinking. An example of faith based thinking, apparently, is that climate change can’t be happening because God told Noah that there would be no more floods (as predicted because of sea-level rise). If we’re going to put that kind of ‘thinking’ up against verifiable climate science, I know where I’m putting my money. Recent events in Christchurch highlights official reaction to climate change related events: mops and sandbags. For a long time now the scientific mantra has been that no particular weather event can be ascribed directly to global warming; the new understanding is that all weather events now take place within the context of a warming world and increased climate volatility. The Christchurch floods are right in line with climate scientists predictions as to what is in store for that hapless city. And John Key’s response. Break out the mops. Push the water back into the water. This reminds me of Auckland Councils repose to flood a couple of years ago on Waiheke Island. A number of us have said that when the Causway gets flooded, we’ll know sea-level rise has come to Waiheke. Well, a King tide did combine with some heavy rain, and soon the sea was slopping at the very edges of the Causeway. The Council flew into action and sent a couple of brave lads with yard brooms to push it back. The assumption behind Sandbag-and-Mop politics is that these extreme weather events are one off events after which everything goes back to normal. Within our warming world, however, there is no normal. It was interesting to hear Christchurch’s new mayor, Lianne Daiziel, acknowledging the fact of Climate Change and its effect on the city on National Radio’s morning report recently. We need a lot more of that freshness and honesty. While I have never been good at maths (I lost track somewhere around long division), graphs have always fascinated me, a bit like maps. You have a picture of the world, or at least some aspect of it. Graphs are ideally suited to what I call the ‘quantum capacity’ of the human mind to grasp information almost instantly. Some graphs, however, are worth lingering over, such as the global average temperature anomaly. The graph below, showing sea level rise and projected sea-level rise in the Auckland area is also worth a good look. While it is pretty much a standard deviation graph, that is, deviations from the average, one unusual feature is that it has two different referents running vertically up each side instead of the usual one. The left hand vertical measures existing sea-level rises relative to the 1961 – 1990 average, while the right hand vertical measures future sea level rise relative to the 1980 – 1999 average. The lime yellow line jumping up and down is yearly data supplied by the Ports of Auckland. These yearly variations can all too easily obscure the underlying trend. This is where the ‘once in a hundred years’ or ‘once in fifty years’ rhetoric comes from, and the graph reveals how deceptive that is. During the peak tides of 2000, some wise old codger would remember that it was just as bad in the late 1940s, and again in the late 1960s – the implication being that nothing has changed, whereas in fact the ten year averaged data line shows the underlying trend standing out against the natural yearly variation. It’s just too easy for us to remember the peaks and miss the trend. What the graph in total reveals is that despite public perception sea levels have in fact risen and will continue to rise as we continue to put C02 and other gasses into the atmosphere. Where is the Supercity’s planning for this? Today’s blog is really an addendum or afterthought to the last blog. It’s a curious effect, you begin writing about global warming and end up writing about denial, both its cultural and political aspects. Politicians are professional denialists – they get paid for it – the rest of us don’t have that excuse. Both the cartoon below and the quote arrived at the same time, which made me think there was some connection between them. That the cartoon and the quote somehow complement each other. With regard the quote, it seems to go to the heart of the matter. We can live in the echo chamber of our own hopes, fears and projections, or be surprised by the world. We don’t always like being surprised by the world, but the world being what it is, we have no choice. The toon suggests that conspiracy theories are used to bolster faltering world views. Reality always wins. In the last post I put up the foll0wing cartoon. Growing awareness of sea-level rises is sparking something of a back reaction from coastal landowners, understandably enough. Coastal properties have traditionally been the most expensive and the most sought after, nowhere more so than Waiheke Island where I live. Since posting that cartoon, I have heard stories on the rumour mill of landowners paying good money for consultants’ reports attacking the reality of sea-level rise. That’s like paying for a consultant to attack Einstein’s theory of relativity because I want to built a faster than light spaceship, or paying for a report attacking the laws of thermodynamics because I want to keep adding energy to a system but not heat it up. And while I’m at it, I might as well get a consultant’s report to the effect that the moon is made of green cheese because I’ve got some big import plans – a lot of Asians switching to dairy! Note: We are working to open comments on this blog. We got spammed out. Watch this space. 27/1/14 – Keeping a clear head and avoiding lumbering Ignoramuses. It is a grim irony that two of the Western countries most affected by man-made global warming, Canada and Australia, have reactive governments who are busy shutting down climate science as fast as they can. In Canada, Prime Minister Harper has begun an unprecedented program of knowledge destruction by muzzling government scientists and defunding Canada’s world-class fishery, ocean, and environmental libraries. Precious research and data has simply been dumped. Libraries closed and books trashed. We haven’t seen anything like this since the Nazis famous ‘burning of the books’ in the 1930s. As the arctic ice melts with geologically unprecedented speed, and the Inuit people who live in northern Canada watch their eco-system, the environment on which they depend, melt before their very eyes, the government has reacted by choking off the flow of information about these very processes. It may well be true that the fossil fuel industry, the most powerful in the world, has taken over these governments. That industry doesn’t take to too kindly to talk about diversifying from fossil fuels. But that can’t explain the apparently willing retreat of these politicians and the people who support them from the reality the data they are suppressing reveals. My question is, given that those who have studied the climate have been giving warnings of the increased likelihood of these events since the late 1980s, why didn’t he imagine such floods? What’s his excuse? His statement simply announces: I am an ignoramus. The Aussie PM has made similar declarations. Presumably the voters of these two countries are comfortable with this willful ignorance. I’m not singling out the voters of Canada and Australia particularly – we have a softer form of the same denial tactics here. John Key is too cunning to come out and deny climate science (not wanting to back himself into that corner) but at the same time pushes coal exports and oil exploration for all it’s worth. It may be hypocrisy, or cognitive dissonance, or just plain greed, but the political manifestation is an aspect of our deep seated cultural ambivalence around man-made global warming. Which brings me to this week’s links. This is an ongoing story that has hardly touched the media of an attack on NZ climate scientists by a group of rogues who have lumbered the NZ taxpayer with the bill for their misbegotten lawsuit against NIWA. The Judge threw out their attack on NIWA’s temperature record, a small victory in an ongoing war for freedom of information. And The Conversation does the back story by Jim Salinger, NZ climate scientist, here. Reading these stories made me think of our hunter gather ancestors. A hunter’s survival depended on him not pretending that the leaping lion is a harmless kitten, or that there is no lion, or that the lion will kill others and spare him. He needs a clear-headed apprehension of the dangers. But no matter how much they money these groups, or the Koch brothers, or anybody else throws at it, they couldn’t keep the illusion going without our connivance, our own willful ignorance, our votes. How does AGW work? By adding heat-trapping gasses to the atmosphere by burning fossil fuels. It really is as simple, as inescapable, as that. The heat trapping gasses are called Greenhouse Gases (GHGs), and the main one, carbon dioxide (C02) was first identified as far back as the late 1600s, right at the birth of modern chemistry, by a certain Jan Baptist van Helmont who detected the gas when burning charcoal. At that stage it was just dawning on us that what we call ‘air’ is made up of a number of gasses. Over the next two hundred years or so we discovered that C02 is one of a class of gasses possessing the ability of trap heat in the atmosphere. That is, what we call infrared radiation; the heat given off by a fire, or our bodies, which cannot be seen by the human eye. These Greenhouses gasses include, methane, nitrous oxide, ozone and water vapour. While being described as ‘trace gasses’ because they occupy less than 1% of the total atmosphere, their importance was recognised early on. Without their ability to absorb and emit heat there would be no life on earth. It would be boiling hot where the sun fell and deep-space cold in the shade. The heat spreading properties of GHGs makes warmth at night possible. Without those trace elements the temperature on planet earth would be 33 C° colder than it is now. A good way to think of C02 is imagine an invisible porous blanket covering the planet. Sunlight passes right through it unimpeded, but it blocks the escape of radiation within the thermal infrared range – in other words, heat. It doesn’t block it completely of course, just the right amount to create the ‘Goldilocks’ climate of the past twelve thousand years, the period known as the Holocene. During the Holocene, which provided the climatic basis for the rise of human civilization, the levels of C02 remained remarkably stable, somewhere between 260 and 280 parts per million (ppm). As far back as the 1870s and 80s it was speculated that since the Greenhouse Gasses did hold heat, unlike the major gasses, nitrogen and oxygen, altering the balance of them might cause a problem, but without any evidence it remained a speculation until the 1950s, when what we now call the Greenhouse Effect was confirmed. The idea was treated as Science Fiction, and to many it still has that feel to it. It seemed back in the 1950s and before, as it still seems, impossible than puny little mankind could influence vast climatic conditions. It beggared belief, flew in the face of common sense. That attitude was possible, even sensible, for the times when there were about three billion people only on the planet, and well before China, India, Japan and South Korea cranked up their industries. We now have seven billion people on the planet, and the rise of global industry is starkly illustrated by this chart showing industrial C02 emissions. Looking at the chart it’s easy to see where the extra C02 is coming from to cause the planet to heat up. Earth has stored all that carbon safely underground and we, in our wisdom, dig it up and burn it and put it into the air. Again, it’s not within the laws of physics, of thermodynamics, to put this much C02 in the air without heating the planet. The heat has to go somewhere. This is causing an energy imbalance which, as C02 persists in the atmosphere for several hundred years, is not quickly rectified – all the more reason for swift action. When I was wide-eyed teenager, I read short stories in which colonists would ‘terraform’ planets, that is, pump the atmosphere of a barren planet with earth gasses and, after some hundreds of years, voila! you have planet fit for human occupation. In effect, by radically altering the balance of its trace gasses we are inadvertently terraforming earth at the headlong pace – pretty soon, voila! and you have a planet unfit for human occupation. As you see, C02, (and this applies to the other GHGs) are not pollutants in themselves, like coal soot, but are damaging in the wrong quantities. The silliest thing I’ve heard said of C02 is that because we breathe it in and out it can’t be bad for us. That’s like saying because we need to drink water we can’t drown in it, or because a motor needs petrol it can’t be flooded. The next silliest thing I’ve heard said is that because C02 is plant food, more of it must be a good thing. Try applying that logic to your evening cocktail and see what happens. The best that can be said for it is it might apply in limited conditions, in limited circumstances for a limited time. Overall the effect is proving to be devastating. It is sometimes said that if we could see radiation we would not be so tolerant of it. Think of what would happen if we could see the radiation spewing from Fukishima, and see the ocean along that coast glowing with the stuff. The same applies to the odourless, tasteless, invisible C02 and its cousins. The following graphic is a dramatic way to illustrate just how much C02 we are, collectively, producing. Imagine if you had to haul it to the street everyday. Mess with our Sport and you mess with us! From ski-fields to the tennis courts, global warming is starting to impact a whole range of human activities. We are starting to notice. If a mere 2.3% of the heat generated by excess C02 can cause dramatic effects such as the melting of arctic sea-ice and threatening a tennis match in Aussie, what effect is the enormous amount of heat being absorbed by the ocean having, and going to have? And it’s not just the surface. Ocean currents are conducting heat deep into the ocean, to the very bowels of the mother of all life on the planet. If Air and Ocean were characters in a work of fiction, I would describe them in term of a contrast. Air is highly re-active, skittish, rash, quick to take offense, volatile, unpredictable. A mere 1% increased global temperature in the last 120 years is enough to throw Air into a tizzy, a hissy-fit: storms, droughts, cold blasts – air is all over the place. Ocean however is the silent type, deep and dark and thoughtful – and easy to underestimate. Phlegmatic. Reserved, Slow to react, to build up, but all the more powerful once aroused. To abandon the metaphor, the oceans, because of their depth and vastness compared to the thin envelop of air, have a tremendous stored inertia. Anyone who has tried to push a stalled car knows about inertia. At the beginning inertia will work to hide or disguise the energy the object is absorbing, but once it begins to react its processes will be unstoppable. We think that we are fuelling the economy by burning fossil fuels when what are really fuelling is global warming. A few days ago Leila suggested that I write something about Global Warming for the Lasavia Website. Given the mass of data, of evidence, flowing from scientific research, it seems that a diary or dated journal approach is the best. Our understanding of Human caused or Anthropomorphic Global Warming (AGW) is evolving rapidly as events unfold and information rolls in, a book or one-off piece of writing is soon outflanked by events and discoveries. We need a medium as agile and flexible as a web or blogsite that can keep up with the twist and turn of events, even though the fundamentals of the science, which I intend to cover here, do not change. For example since Leila spoke to me the number crunchers have emerged with some fresh details. Last year was the hottest year ever recorded in Australia (New Zealand recorded its second warmest year), November was the hottest month ever recorded globally, and 2013 declared to be the fifth hottest year on record globally. Two or three months ago Carbon Dioxide levels, from human emissions, topped 400 part per million (ppm), the highest it has been for three million years. A milestone barely acknowledged in our media. These facts, and others like them, along with the media’s reluctance to even mention climate change, have profound and immediate implications, but need to be put into context and understood in terms of the emerging pattern. This is easier said than done. We like problems that have solutions. We like quick fixes. As a culture we are not that good at inter-generational thinking. Like the media that reflects us, we can flare up in the face of a crisis and do remarkable things, but we are not good at the slow burning, accumulative crises. How big does the huge floating continent of plastic in the Pacific Ocean have to get before our local Waiheke supermarket moves against plastic shopping bags? How extreme does the weather in Australia have to get before the background cause is fully acknowledged at the cultural/political level? AGW is, or at least has been, a slow burning, cumulative crisis. There are no quick fixes, there are no solutions within our hydrocarbon consuming culture, and the problem is ongoing and intergenerational. So we do our best to ignore it, hope it will away or that somebody got it wrong. Pie in the sky replaces reality. This is made worse by the fact that the picture, the pattern that emerges when we grasp what we have done, when we see it, and it’s easy enough to see, is a tragic one. It’s not exactly anybody’s fault, or at least it didn’t start that way. Medieval humans who clustered gratefully around their coal fires had no inkling that a by-product of the burning process were gasses that, in sufficient quantities, could change the climate of our planet. Nor would they have cared, most probably; their immediate survival was at stake. Our own thinking has not advanced much past that. Human population numbers rose rapidly upon the discovery of first, coal, which enabled greater numbers to survive winters, then of oil which enabled the development of a planetary industrial and technological society. Earth’s population of seven billion or so is predicated on the use of hydrocarbons, that is fossil fuels, in both industry and agriculture. We are, in short, a hydrocarbon consuming culture: we burn it, we grow food in it (pesticides and fertilizers), we make plastic out of it – the very computer I’m working on is made from several barrels of oil, both the energy to create it and the materials it contains. Now we have to face the fact that burning fossil fuels, the very life blood of our economy, is now our greatest threat, greater than terrorism, greater than all other threats combined. No wonder we balk at the idea. No wonder we seek to reject or deny the full implications of it. I would venture to say that human AGW, is the greatest challenge facing our species. That challenge boils down to this: can we live in the real world or will we opt for some elaborate fantasy? When we cannot stand to see the reality is exactly when we need to most. Spiritual discourse is often driven by notions of transcendence. These can be dangerous when they are impelled by a desire to escape, or an inability to face the real world. As we face the facts of AGW in the posts to come, we will, at the same time, have to face our reaction to these facts. The denial, implicit and explicit, of AGW is at least as important as AGW itself, if not more so. Science cannot tell us how to live, only what is. The early 20th Century poet TS Eliot said, ‘mankind cannot bear every much reality.’ We now have to prove him wrong. This article appeared in the November 28, 2011 edition of The Nation.